Abduction in Stafford County not really an abduction. An Amber Alert has been cancelled and the 17-year-old girl has been found safe and unharmed in Florida. An Amber Alert was issued after witnesses saw the teenager being forced into a van at a Target store located at 25 South Gateway Drive in Fredericksburg around 11:30 Saturday morning. Stafford County Sheriff’s Office says what the witnesses saw was the girl kicking and screaming as she fought with her family members because she did not want to move to Florida. The family told the Jacksonville Police Department that they stopped in Stafford County on the way to a move to Fort Lauderdale, Florida. The 17-year-old was found with her family in Jacksonville, Florida at 12:20 a.m. Sunday. Video: Bob McDonnell in Stafford County on September 1st. I’ve also got pictures that I’ll upload later. Is “Common Sense Virginia” omnipotent or just plain lying? Republican campaign kickoff event at Stafford Regional Airport: Video. Republican campaign kickoff event at Stafford Regional Airport: Pictures. Beside the usual suspects of Bob McDonnell, Bill Bolling, Ken Cuccinelli, and newly elected Republican Party of Virginia Chairman Pat Mullins, Senator Janet Vogel made the introductions and Speaker of the House of Delegates Bill Howell and Delegate Mark Cole were also in attendance. Fellow blogger and Stafford County GOP member Scott Hirons was there recording video too. He thinks he’s cool with his HD Camcorder while I only have a lowly MiniDV camcorder…bah! Spotsylvania County GOP Chairman Bryce Reeves was also in the crowd. Trillions of dollars in debt but the federal government has money to buy a swamp. Congressman Rob Wittman announced the award of a conservation grant of $855,465 for the phase two acquisition of Crow’s Nest in Stafford, Virginia. The grant money, to be awarded in 2009, will cover the purchase of 1100 additional acres. Meanwhile, Caroline County doesn’t have the money to do anything with an extremely dangerous intersection at Route 207 and I-95. Oh well, we got money to pay for a swamp. And if anyone is interested, I have some land west of Miami I want to sell you. Throw your three-year-old daughter in a pool, refuse to rescue her while she sinks to the bottom, have a beer and kick your one-year-old daughter accross the room while your other daughter goes to the hospital, get a year in prison. Sounds proportionate to me; what about you guys? To recap: A man who missed two court dates in Stafford County — while he was sitting in jail in Norfolk — received a jury’s recommendation to serve a year in prison (link). A mother who threw her 3-year-old daughter in a pool and let the toddler sink to the bottom will spend a year in prison. The incident that led to her charges last Aug. 6 occurred when she was intoxicated with a .26 blood alcohol content, according to evidence presented yesterday in court. According to a March plea agreement, Frank was playing in an outdoor pool at a friend’s home with her 3-year-old daughter last summer. While playing, the toddler ripped Frank’s shirt, so she angrily threw the girl into the center of the pool. She sank to the bottom. After realizing Frank was not helping her daughter, a 7-year-old girl went to the bottom of the pool to bring the toddler up for air, according to the agreement. While the 3-year-old was en route to the hospital, Frank sat on the couch, drinking a beer, and, still angry, kicked her 1-year-old daughter across the kitchen floor, according to witness statements in the plea agreement. The incident with her younger daughter is what led to Frank’s assault conviction. You’re supposed to have a dog license to own a dog right? I am hereby purposing that before you are allowed to have children you should have to obtain a breeding/children license. If it’s good enough for dog breeders (ask Bobby Orrock), why not humans? We can change Animal Control to Human Control too. Ditto for the Animal Shelter, it would be a Human Shelter. We must do it for the children! Stafford County Board of Supervisors provides some humor (unintentionally) on the BPOL tax. Essay question: Better or worst than the Caroline County Board of Supervisors? Stafford BOS manages to please absolutely no one. The Stafford BOS voted to impose a Business and Professional Occupancy License (BPOL) tax starting in January 2010. Indeed it is, and there is hardly a tax more damaging than BPOL, which is a tax on revenue, not profit. Moreover, this business crippling tax was first implemented for emergency purposes only – to let Virginia counties recover from the damage done by the War of 1812. Yes, you read that right – the War of 1812. So now, both anchor counties in the Fredericksburg area will be reeling from tax increases: property taxes in Spotsylvania and BPOL is Stafford. The local economy is in deep trouble. Stafford County Democrats George Schwartz, Joe Brito, Bob Woodson and Harry Crisp have approved a highly controversial businesses tax, called the Business, Professional and Occupational License or “BPOL” in a meeting that stretched until later than 3:00 am! These liberals call it a “revenue generator” for the cash-strapped jurisdiction, but let’s be clear: RAISING TAXES IS NOT A REVENUE GENERATOR- it’s a TAX INCREASE! The proponents will tell you that BPOL was intended, among other things, to stabilize the wild year-to-year fluctuations in Stafford County’s revenue stream and make sure that there would always be enough money in the annual budget for schools, public safety, and other requirements. We were told that its passage would end the yearly bickering over school funding. The entire board, however, agreed that revenue generated by BPOL will be used to upgrade county roads and help pay the debt service on a potential transportation bond. So much for stabilizing school-funding. The next local election in Stafford in November 2009 should be interesting as both D. J. and Dan point out as well. Tim, per the headline of this post, I think the characterization that no one is pleased is inaccurate. While I and other “Pro-Business Dems” remain opposed to this version of BPOL (because it is regressive, a bureaucracy that in the end won’t raise that much in revenue, possibility punitive to small but growing businesses, and because the timing of the passage of BPOL in a recession is truly ill-advised), there actually are many supporters of BPOL in Stafford (Democratic, Independent, and Republican). Really, this is not a left/right issue, although the Stafford BOS members in Republican the minority would have anyone believe that. As sure as the sun comes up tomorrow, they will continue to make political hay of it. Truth be told, the rhetoric on both sides (pro-BPOL vs. anti-BPOL) remains way overmodulated. We do need new revenue in the county, for sure, and lots of it. Our schools and our critical services are severely underfunded. We pro-biz Dems are not making our pro-BPO friends happy with our public skepticism. But being small-business owners first, politicians second, we must do all that we can to support the business community and encourage new businesses to arrive in Stafford, and stay. That’s what will generate the revenue we need. He brings up an excellent point about the bureaucracy involved. How many additional positions are going to be required at the Commissioner of Revenue’s Office and/or Treasurer’s Office to properly assess and administer these new business’s taxes? Update: Nice try: The Free Lance–Star attempts to remove their jokes about sexual battery. They have since changed the headline of the story that appears on the front page of fredericksburg.com and have removed the picture of a roll of toilet paper that appeared in the original. Link to the new story with the headline “Man squeezed more than Charmin in local grocery store, police say” and without the picture of a roll of toilet paper. 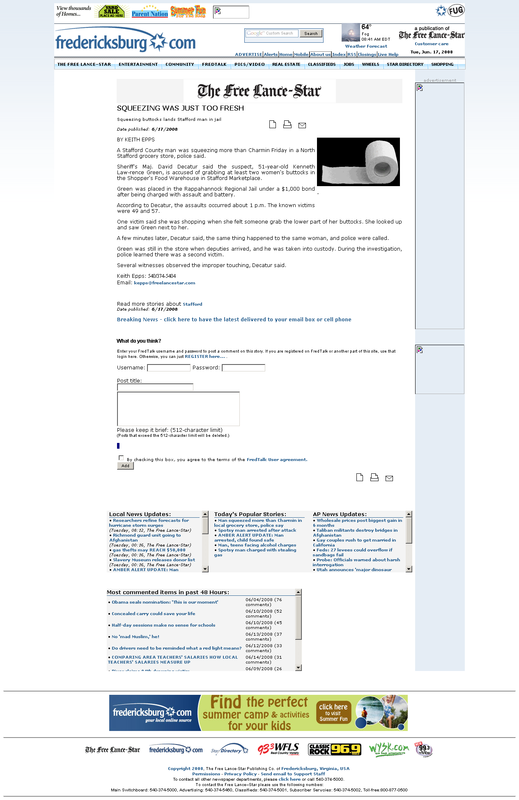 Link to the old story with the headline “SQUEEZING WAS JUST TOO FRESH” with the the picture of a roll of toilet paper. And if they bother completely removing the original story, don’t worry kids, because I took a screen shot of the original story which is available here.